This is a guest blog by Zoë Slatoff, who is currently undertaking doctoral studies at Lancaster University, UK and is also a seasoned Ashtanga Yoga practitioner and teacher. She has an M.A. from Columbia University and is the author of Yogāvatāraṇaṃ, a Sanskrit textbook for yoga students. Walk into any bookstore today, and you will see yoga and Ayurveda acclaimed as “sister sciences.” But it is only recently, with the widespread practice of yoga by householders as well as renunciants, that they have been actively joined together. The first and only known text to attempt a synthesis is the Āyurvedasūtra (ĀS), a little-known anonymous work, generally dated to the sixteenth century. The text takes the sūtra part of the Pātañjalayogaśāstra (henceforth Yogasūtra or YS) and supplements its goal of liberation with the pursuit of worldly happiness, tying them together using ayurvedic principles. As Kenneth Zysk (1993:212) notes, “despite its title, the Āyurvedasūtra is a product of Yoga rather than of Āyurveda.” But regardless of the text’s original intention, it was known to every ayurvedic doctor I met during fieldwork in Mysore, but not to yoga practitioners or scholars. The palm-leaf manuscript of the Āyurvedasūtra was discovered by Shamashastry in the early twentieth century, and contained five chapters, along with the commentary of Yogānandanātha. Three other manuscripts were also found in Tanjore and Madras. Shamashastry (1989, v) called the process of creating a critical edition from so few manuscripts “an almost hopeless task,” since there appear to be many sūtras that are missing or reordered. Nonetheless, the text’s intention of integrating yoga and Ayurveda is clear, as the following examples from my edition and translation of chapters 1-4 of the Āyurvedasūtra (Slatoff 2009) will show. A fundamental concept, expressed repeatedly, is that toxins (āma), caused by undigested food, are the cause of all disease and must be removed. But rather than dwelling on physical health, the Āyurvedasūtra (1.15) explains that once this disease-free state is achieved, the obstacles to self-realization disappear: “To the extent that one is free from disease, one contemplates [the Soul].” Simplistically, Ayurveda can be fitted into the yogic paradigm as a means to provide the basic health of the body required to attain samādhi (absorption) and mokṣa (liberation), the only of the four aims that is traditionally accepted in yoga. But additionally, yoga practices can help lead to a long and healthy life. As explained in the commentary on ĀS 1.33, a sūtra about anti-aging and rejuvenation therapy, the heat of the sun illuminates the fire at the root (mūlādhāra) cakra, which causes the breath in the form of the kuṇḍalinī energy to rise upwards to the crown (sahasrara) cakra, where a drop of nectar (amṛtabindu) is released, nourishing the seven constituent elements of the body (dhātu). In chapter two, the vowels and then consonants of the Sanskrit alphabet are located physically. It seems that unlike the tantric practice of nyāsa, which assigns mantras to different parts of the body to ritually purify them, in this conception, these sounds exist already and appear to be either diagnostic or curative. Most significantly, chapter three of the Āyurvedasūtra goes through much of the first chapter of the Yogasūtra, correlating Patañjali’s aphorisms with ayurvedic concepts and giving dietary prescriptions to aid on the path of yoga. It begins with the first statement of the Yogasūtra (1.1): “Now there is the teaching of yoga.” Although Yogasūtra 1.2 (“Yoga is the stilling of the fluctuations of the mind,” is not stated explicitly until much later in the chapter, the implications of this definition of yoga are discussed in the next ten sūtras of the Āyurvedasūtra. In both texts (YS 1.3 and ĀS 3.13), when the mental fluctuations are stilled, “then there is the stability of the Seer in its own true nature.” The five kinds of fluctuations are defined only succinctly in Yogasūtra 1.6; however, in the Āyurvedasūtra, each is elaborated upon in great detail, with supplementary ayurvedic knowledge. For example, when defining sleep, the fourth fluctuation, after the standard definition (YS 1.10 and ĀS 3.54) of “the mental state whose foundation is the absence of cognition,” The Āyurvedasūtra (3.55) goes on to explain its cause as “the eating of substances which contain the tastes bitter and pungent.” And the last mental state, memory, defined by both texts (YS 1.11 and ĀS 3.56) as “the retention of a sensory object which is experienced,” is explained by Āyurvedasūtra (3.57) to arise from sattva, which is produced from the transformation of sweet tastes. In both texts, a yogi learns to control these states through practice and detachment. The Āyurvedasūtra goes on to discuss the different types of absorption, similarly to the way in which they are addressed in the Yogasūtra. It then explains that one achieves these states by eating sweet tastes, which nourish the cakras in the body, causing the nectar to flow through the subtle channels. This in turn nourishes the constituent elements of the body and supports yoga practice. In other words, an ayurvedic diet supports the body, which leads to the more internal goals of Patañjali’s yoga. The commentary on ĀS 4.14 explains further: “The salty taste produces tamas, which is the root cause of ignorance (avidyā), the first affliction (kleśa), and the ground for all the other afflictions: egoism (asmitā), attachment (rāga), aversion (dveṣa), fear of death (abhiniveśa).” These afflictions are the subject of the beginning of chapter two of the Yogasūtra and the cause of the misidentification of puruṣa (the soul) with prakṛti (material nature), which causes suffering. Liberation is ultimately reached by discerning the difference between these two. The Āyurvedasūtra appears to be part of a tradition of synthesis, similar to the Haṭhapradīpikā and Yoga Upaniṣads, which arose around the same time. It draws on many different texts including Vāgbhaṭa’s Aṣṭāṅgahṛdayasaṃhitā, various Upaniṣads, and two commentaries on the sūtras of the Pātañjalayogaśāstra: Bhoja’s Rājamārtaṇḍa and Rāmānandasarasvatī’s Maṇiprabhā. There is a strong emphasis on external practices leading to the internal, more advanced, states of yoga. Additionally, there is a repeated focus on eating foods with sweet taste. Perhaps we should all just eat payasam (rice pudding) or ice cream and we will be more sattvic and therefore closer to a yogic state? What seems most important, though, is the underlying idea of making yoga practice applicable to a wider audience of householders. This is one of the defining characteristics of modern yoga. The desire to use the Yogasūtra as a foundation has also become an essential theme, with many teachers adapting its contents to support contemporary practice. It raises questions about the paramparā or transmission of these syncretic texts and the ongoing process of synthesizing and re-visioning knowledge, which leads to new forms of practice with new possible results. As this innovative text explores, by means of the union of yoga and Ayurveda one potentially has the means to achieve all four human aims and transcend both worldly and otherworldly limitations. 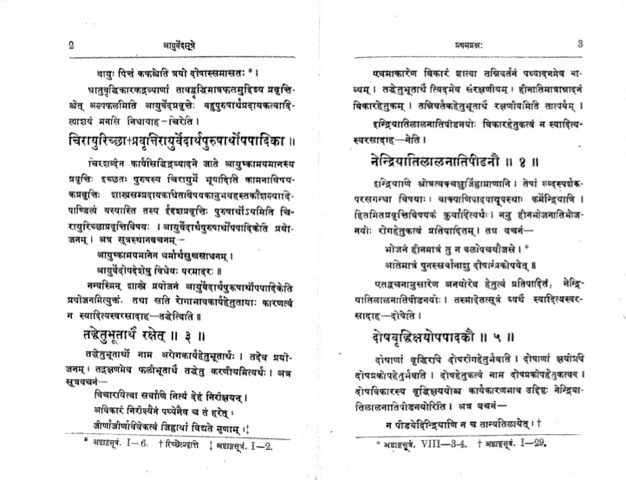 Āyurvedasūtram with the commentary of Yogānandanātha. Edited by Dr. R. Shamashastry. Mysore: Oriental Research Institute, 1989. Meulenbeld, Gerrit Jan. A History of Indian Medical Literature. Groningen: E. Forsten, 1999-2002. 5v. Pātañjalayogasūtram, with the Rājamārtaṇḍa of Bhoja Rāja. Vārāṇasī: Bhāratīya Vidyā Prakāśana, 1963. Slatoff, Zoë. “The Birth of Modern Yoga: the Confluence of Yoga and Āyurveda in the Āyurvedasūtram.” M.A. Thesis. Columbia University, 2009. Zysk, Kenneth G. “The Science of Respiration and the Doctrine of Bodily Winds in Ancient India,” Journal of the American Oriental Society 113.2 (Apr. - Jun. 1993).